Amid chaos over defense cuts and strategy, the Ministry of Defense’s newest boss will be paid up to £535,000 (US$800,000) a year to lead the department’s multi-billion pound equipment program. Tony Douglas, CEO of Abu Dhabi Airports, is the latest high-powered corporate executive to make a move to the public sector. He will become Head of Defense Materiel at the Defense Equipment and Support (DE&S) agency, which sources and purchases military equipment ranging from boots to jet fighters. The figures were originally disclosed to the Financial Times newspaper by two senior civil servants. With a basic salary of £285,000 and the potential to earn another £250,000 in performance-related bonuses, Douglas will become the highest-paid civil servant in Whitehall at a time when defense austerity is high on the political agenda and in the wake of numerous equipment scandals at the MoD. “If there isn’t a dramatic improvement, taxpayers will be rightly furious at the size of this pay packet,” TaxPayers’ Alliance representative Andy Silvester told the Daily Mail. Douglas will start at the MoD in September, replacing the current CEO Bernard Gray. Gray, who took over in 2011, did not have his contract extended after being heavily criticized on a number of occasions. He was found to have spent more than £20,000 of taxpayer’s money on luxury hotels over the first 10 months of his appointment. In 2013, he came under fire again from trade unions for attempting to privatize DE&S. However, he failed in his objective as all but one consortium withdrew from the tendering process. Douglas’ appointment coincides with reports that Britain's £100 million Lightning II fighter jets, purchased during Gray’s time as head of the DE&S, could be brought down by if hit by lightning due to a technical fault. The controversy over the aircraft, which the Royal Air Force (RAF) website describes as “all weather,” is one of a long line of scandals to have hit the MoD in recent years. Last year an annual spending review revealed that the MoD had spent more than £7 million on mine detection equipment, which did not work and £6 million on faulty earplugs. 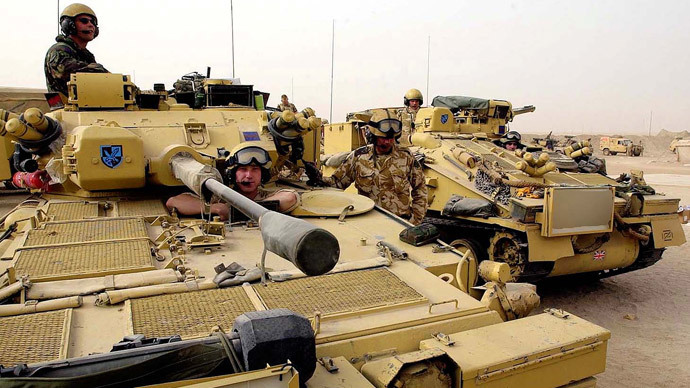 Military expenditure has become a major topic heading into the May general election, with military and civilian leaders engaged in furious debate over the planned military reductions that have emerged from the Strategic Defense and Security Review (SDSR). A central strand of that discussion has been Britain’s willingness and ability to contribute the symbolic 2 percent of Gross Domestic Product (GDP) to the NATO alliance, played out against a background of purported strategic threats from Russia and the Islamic State.